That Catwoman chest piece is brilliant in it's detail, especially considering the curve of its canvas! Looking exactly like a press poster for Batman Returns, this is the kind of size and calibre I wish those old chewing gum tatts came in! If you know who the artist or person wearing this mega cool magic is let me know - it's too good to go uncredited! Bullseye looks perfectly at home in flames, be they those of hell or as his latest victim burns. A tattoo sleeve that will have even super-enhanced blind men trembling, it was photographed by 'earthdog' at Comic Con 09. Determined not to let the 'Eye have all the mercenary buzz, DC's Deathstroke jumps into the skin-art fray - all guns blazing! We don't often get great tatts of Wade Wilson, but this one by skin artist Jason Clay Dunn sure qualifies! Believe me, you don't want to know where he put Aquaman, but hey after a decent curry, there are Red Tornadoes for all! 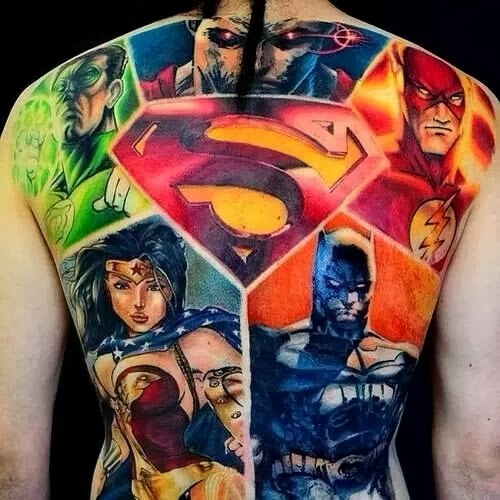 With the big Superman shield in the middle there, I'm not sure if this amazing back tattoo is the Justice League of the pre DCnU, or just 'Superman's amazing friends', it really is an awesome shot as to why the classic DCU was the greatest universe going. I can't pick what segment came tops, Ethan Van Scriver's Green Lantern and Michael Turner's Flash are too close in awesome to call. "Believe me, you don't want to know where he put Aquaman", but I'll bet he's holding a "trident"... of sorts. That Catwoman is BEAUTIFULLY done... But damn, what an ugly tattoo! This weird amorphous blob taking up your entire side? For my tastes; that Deathstroke is the clear winner. No stupid background, or fade-outs. But it would be even better looking with out that bright-orange transitional outline. 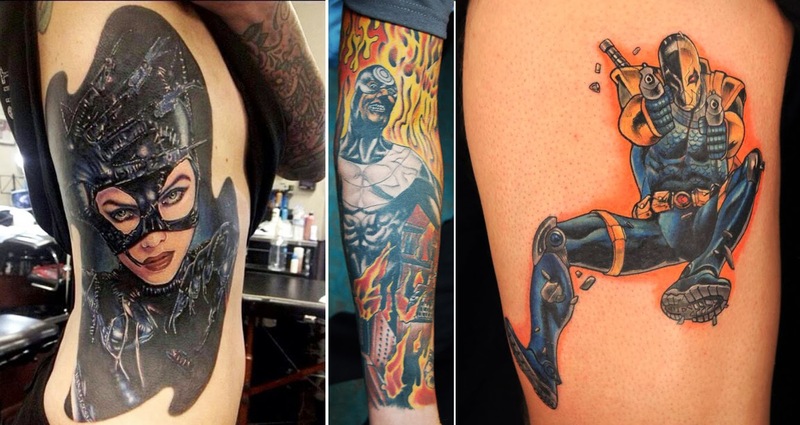 That's what I always reckon looking at tattoos King, how do you round things out if the source has no legs or lower body? I'd hope folks would opt for a starburst with 'Dan is cool' at the base but despite a reasonable viral marketing push (this reply being it) it doesn't seem to have caught on.